Work Comp Complex Care Blog – affiliated with Total Medical Solutions, a FL-based firm that focuses on home health care and complex care products and services for the workers’ comp industry. 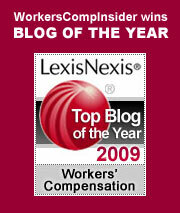 Lexis Nexis Workers Comp Law Blogs – this is a news feed of various law bloggers who post on workers’ comp legal matters. MEMIC Safety Blog – safety & loss control consultants from Maine’s largest workers’ compensation insurer post about workplace safety issues. Advanced Safety & Health Blog – safety & prevention news sponsored by a company of the same name. Coal Tattoo – investigative reporter Ken ward Jr. of The Charleston Gazette blogs about West Virginia mining, mining safety, mining-related public health issues, and more. Today’s Workplace – a blog from workplacefairness.org, a non-profit organization that provides information, education, and assistance to individual workers and their advocates nationwide and promotes public policies that advance employee rights. MassDevice Blog – This blog is associated with Massachusetts Medical Devices Journal, an online journal of the New England medical devices industry, with coverage of emerging trends, technology and devices that save lives. Medgadget – this long-time favorite bills itself as the internet journal for emerging medical technologies. WSJ Health Blog – Wall Street Journal’s blog on health and the business of health. Considered by many as the gold standard for workers’ comp blogs, the Workers’ Comp Insider covers it all: workers’ compensation, risk management, business insurance, workplace health & safety, occupational medicine, and much more. Launched in September 2003, this weblog proved how a company can harness the power of the open web by allowing its employees to voice their opinions and showcase the company’s expertise. We appreciate the recognition, and we’re happy to see so many fine blogs in the work comp arena today – it was sure a quiet place in 2003 when we first hung out our shingle. Be sure to visit and check out some other fine blogs in this space – we’re happy to see many blog pals there and look forward to discovering some new finds. And if you have a mind to, LexisNexis is taking recommendations for the TopBlog of 2009 – we’d welcome your input and appreciate any votes of confidence should you so choose. Workers Comp Insider: 5 years and counting! Yay us! This month is our 5th year blogging anniversary so we were pleased to be named to Lexus-Nexus Top 25 Blogs for Workers Compensation — and to see a few of our esteemed colleagues on the list, too. We have to laugh because when we started, we weren’t sure we would find enough to post about to make it to year 2, let alone year 5. And back then, the business blogging landscape was pretty thin indeed, so we’d never have foreseen such a robust community emerging for such a niche topic. Carpal Tunnel Syndrome, Older Workers…and Insider Bias? Robert Laszewski of Health Care Policy and Marketplace Review is hosting a fine edition of Health Wonk Review today, the bi-weekly roundup of some of the best posts from the policy wonks in the health care blog world. Lately, as the debate about health care heats up, Health Wonk Review is a good way to keep up on the issues with perspectives from the experts. Today’s post is no exception and Bob has packaged it all into an entertaining read – check it out!